Here is a photo I took of a water lily at Shinewater Park in East Sussex yesterday. The Latin name for the genus is nymphaea, which mean "water lily", but was inspired by the nymphs of Greek and Latin mythology. 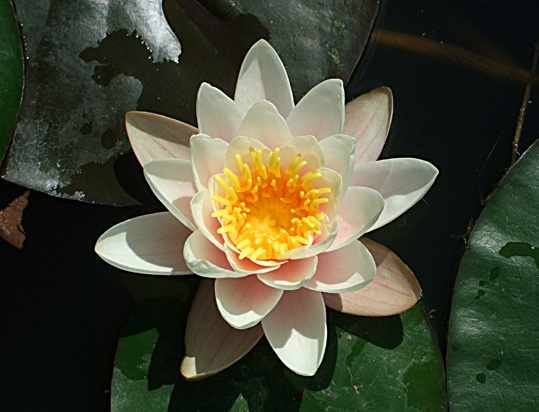 The ancient Egyptians revered the Nile water lilies, which were known as lotuses. The flowers of the blue Egyptian water lily open in the morning, but sink beneath the water at dusk, while those of the white water lily open at night, but shut in the morning. Egyptians found this symbolic of death and the afterlife. A Syrian terracotta plaque from the 14th-13th centuries BC shows the Goddess Asherah holding two lotus blossoms. An ivory panel from the 9th-8th centuries BC shows the god Horus seated on a lotus blossom, flanked by two cherubs.